Mad Scientist are not just called that – this scientist really is mad! Why else would he employ materials that go against common sense? 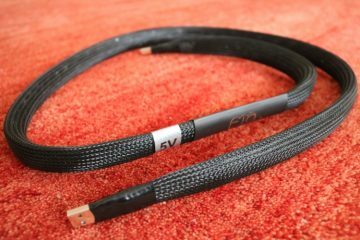 Here’s the short version: the cables reviewed here are “heretical” in part due to the use of materials that have very high resistance. Mad Scientist pose that conductivity is not the most important parameter for interlinks at all. They offer plenty explanation for this and you can read all about it on their Mad Scientist website. The Flexible Carbon/Graphene interlinks utilize tens of thousands of ultra-fine strands of carbon inside an oversized teflon tube. This makes for an overly flexible cable, if it weren’t for the thick copper wire that is added around this which forms part of a “bad antenna” design fighting RFI pickup. 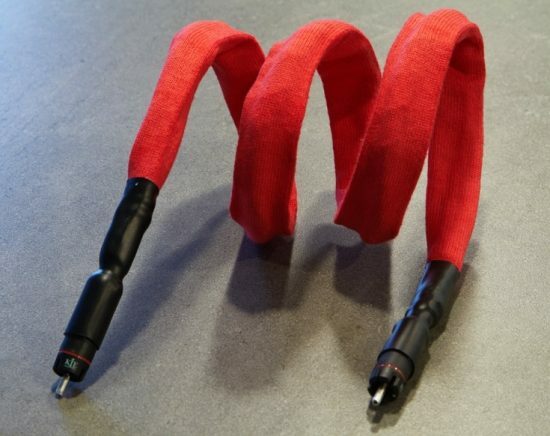 1) Flexible Carbon/Graphene (FCG): this one uses the new flexible fiber along with new construction techniques designed to cancel RF inteference. Graphene is used at the metal/carbon junctions. This interconnect supercedes and replaces the HAC+ model. 2) Flexible Carbon/Graphene PLUS (FCG+): same construction as above but this one uses graphene treatment along the whole length. 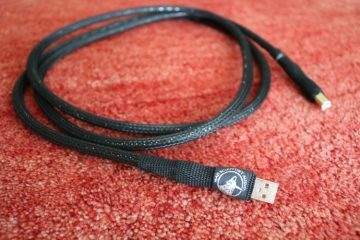 This is Mad Scientist’s best interconnect, and the one reviewed here. Quoting from the manufacturer’s website, “Mad Scientist Flexible Carbon/Graphene Interconnects are a completely new development, unrelated to the HAC and HAC+, using a new flexible carbon fiber and a host of new construction techniques.” So while the FCG also utilises carbon, it is very different from its forebear, and this is clear from the moment that you unpack it. Contrasting with the thin, light and springy HAC+, the FCG+ is thick, heavy and feels very solid. 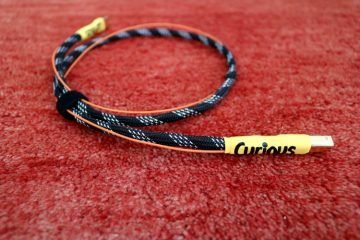 The nice thing about it is that it is supple and easy to bend in any shape, after which the cable retains that shape, as can be seen in the image below. This really makes a reviewer’s life very easy! The FCG can be used both in analog and digital applications. For the purpose of this review I’ve only used it with analog equipment. Currently I have two almost entirely independent setups, in the same room. 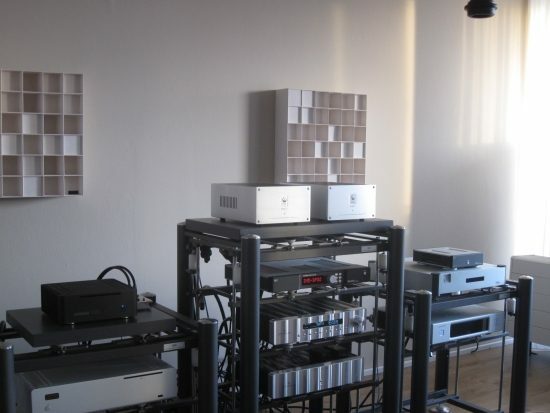 Frontmost are the hybrid dynamic/magnetostatic Apogee Centaurs, and behind them are the Apogee Duetta Signatures. 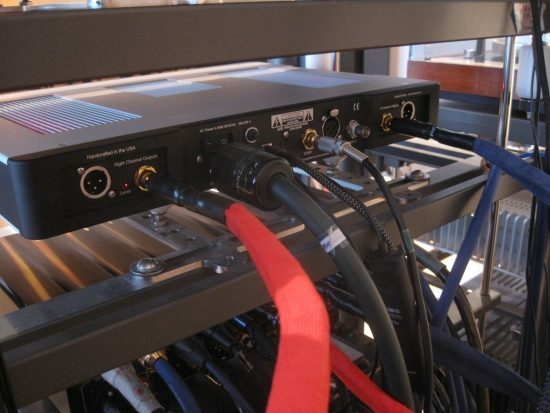 The analog side of my system is based around the Corus + PSU preamp (at this time) feeding a Bryston 3B ST power amp that in turn feeds the entirely original Apogee Centaurs. These were purchased new like a hundred years ago by my dear friend Jan Willem and he only parted with them because he swapped to Duettas a while ago. 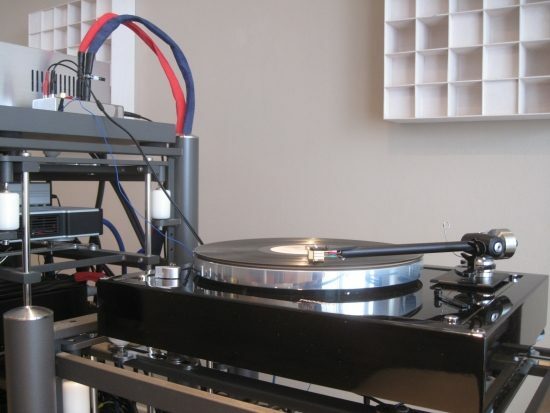 Analog sources include various tangential Technics players, a Pioneer PL-L1000 linear tracker, a standard Thorens TD160MKII and a fully refurbished Thorens TD160B MKII with Origin Live Onyx arm. The latter was used for this review. 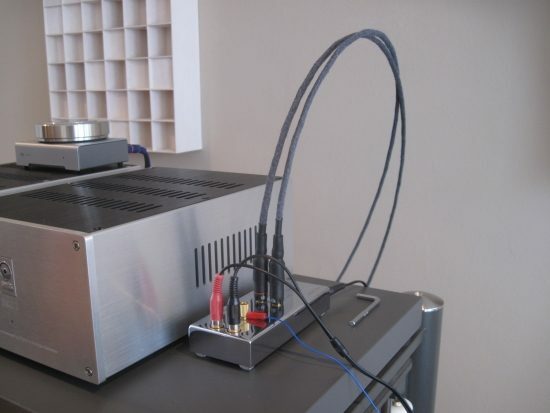 When listening to one system, I always disconnect the cables feeding the “spare” amp, as you can hear the influence of the extra cable as a slight diminishing of dynamic spontaneousness. This is true for the two balanced outputs (that are fed from different taps from the same output transformers, or when using the actively buffered and completely separately adjustable cinch output together with one of the balanced outputs. 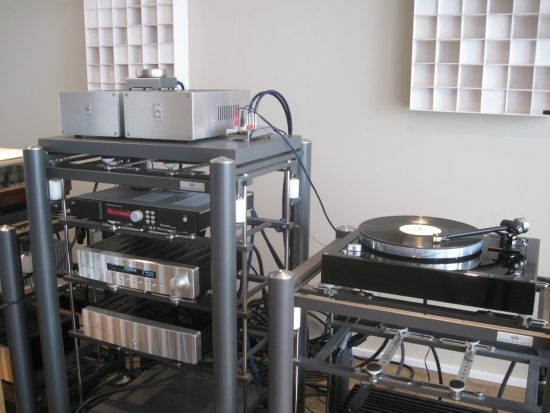 Substituting the Siltech Paris for the Mad Scientist HCG+ on the Benz Lukaschek MC phono preamp fed by the fully refurbished Thorens TD160B MKII turntable, with Origin Live Onyx arm provided an instantly audible, and frankly quite overwhelming difference. While I do like the Siltechs for their simple neutrality and universal application, there is no denying the fact that they are not very forgiving or romantic. The most striking factor of the HCG+ is their instantly likeable charm and liquidity. 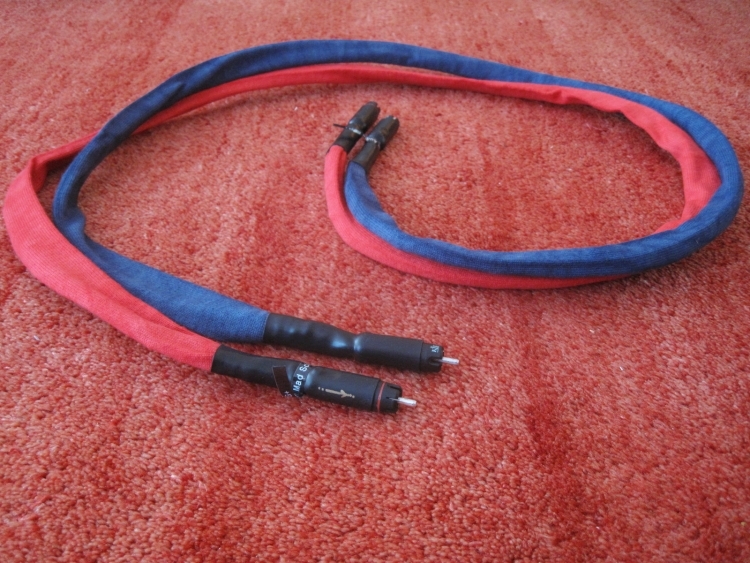 These are very musical cables for sure, but don’t assume these are of the phat, thick sounding sort, quite the opposite. 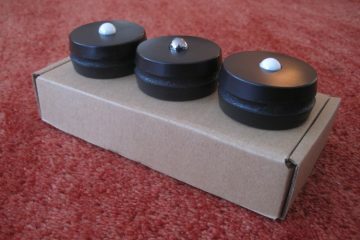 In spite of sounding tonally full and having really powerful bass, the HCG+ is highly detailed. The musical information just isn’t presented in a dissecting manner, but smoothly and very fluidly. 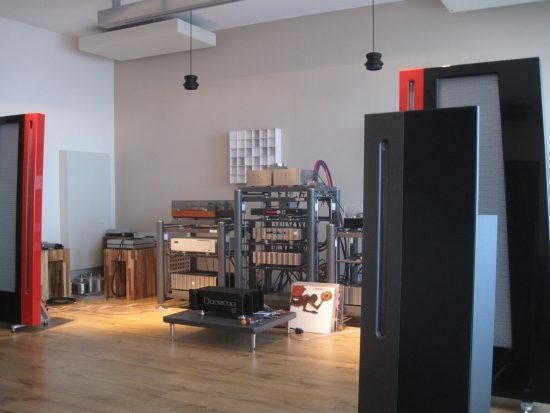 Not only are these sonorous sounding cables, treble is also supremely refined and airy. In a way they remind me of the Transparent Audio sound, but somehow even more organic. Nothing bad to say about them then? Well, no, unless you crave a more sober and direct-coupled kind of sound over the colourful, ethereal and magical presentation of the HCG+. Just perhaps the transients are slightly less instant than with the Siltech, but dynamics and PRAT are still well up there. Going back to the Siltech confirms that it is a little more spritely in nature, but rather bright and coarse and frankly not very appealing anymore. 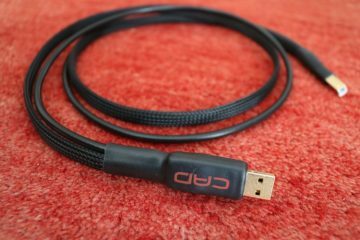 The FCG+ came into existence following development based on the HAC+, which is a carbon-based cable as well. 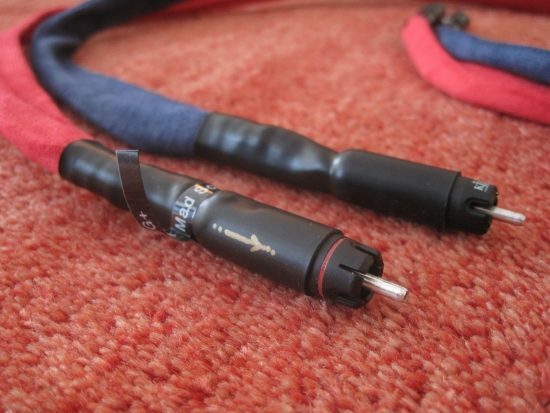 As I also have this cable in my inventory, this should make for an interesting comparison. Listening to the HAC+ again confirms why I was raving about it when I first heard it. It still is a very, very good sounding interlink with a tonal richness that belies its thin appearance. 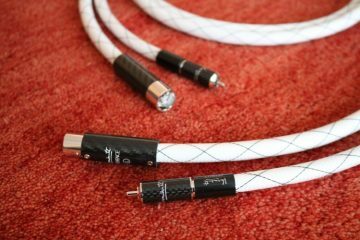 This cable’s treble is really excellent too, very similar in fact to that of the FCG+, and overall it exhibits the same rare mixture between detail and liquidity. 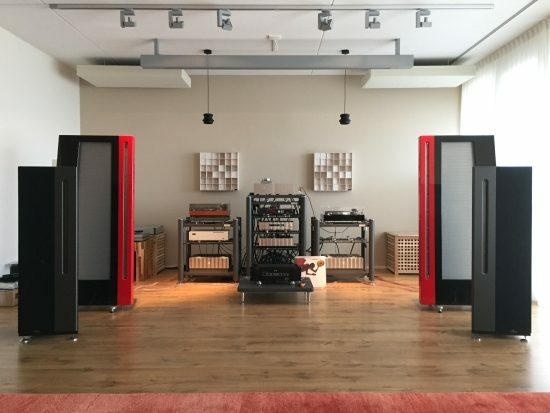 Further down the frequency range is where the differences manifest, with a less creamy, but arguably more lucid midrange and less sonorous but a little tighter bass. Arguably this could be interpreted as being more transparent, and in very rich sounding setups it may well be a perfect fit, but another way of looking at it would be to say that the HAC+ was very slightly thin, and the FCG+ is more filled out at the bottom. Also the new cable’s soundstage portrayal is quite different, more extended horizontally and laterally, with a more solid rendition of images within. Ultimately I am most taken by the FCG+’s combination of deep, juicy and sonorous bass with superbly airy treble, with a rich and creamy midrange in-between. 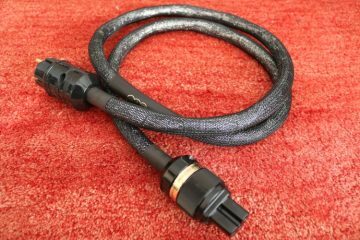 An important aspect of the new cable’s design is that it can be bent in any shape without risking failure. 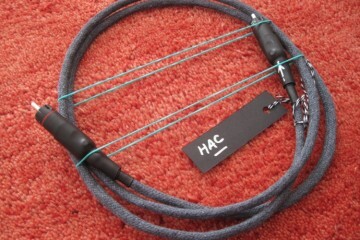 Although I have never had an issue with the HAC+, their stiffness does make them less favourable to use for a cable swapping maniac such as myself. 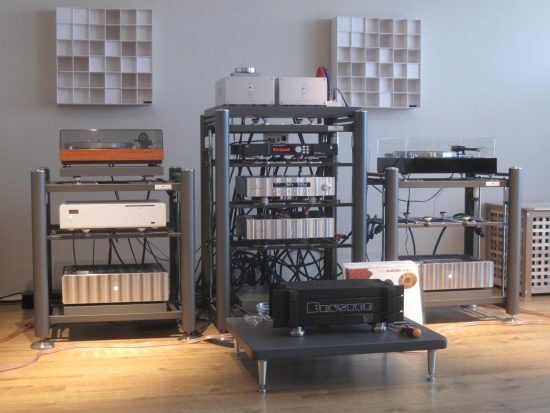 The digital side of my system (also at this time, this is perpetually in motion) is also based around the Jeff Rowland Corus + PSU preamp that for this application feeds the Rowland model six monos that in turn feed the fully refurbished Apogee Duetta Signatures. These speakers have been around in my listening quarters for years now, but always in the shade of the Apogee Divas. Now that I have sold the Divas, the Duettas are finally getting the exposure that they so deserve. Recently they were fitted with the latest KLM5 MRTW ribbons with new interfaces and wired returns. 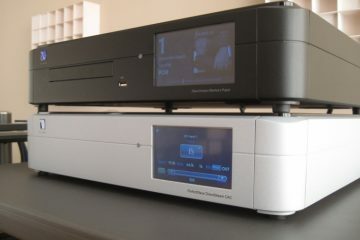 Source in this case is Roon running on a standard Windows PC, streaming via Roon RAAT protocol to an AudioAanZee Reference Flow music server with Euphony Drive. 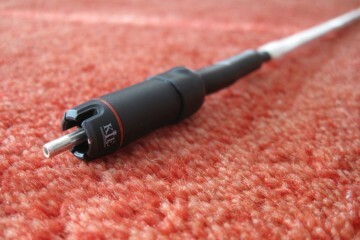 Although I normally use XLR cables, the Bricasti M1 DAC has both XLR and RCA outputs and sounds great with both. Here I normally use a Cardas Clear, which is very transparent and neutral, but in typical Cardas fashion still smooth and fluid, and never exaggerated. This can make it sound slightly less forceful in the transient behaviour compared to harder hitting interlinks such as the Siltechs, but it is usually also more forgiving and more musical for it. Above: Mad Scientist FCG+ connected to Bricasti M1 DAC, with Cardas Clear disconnected. 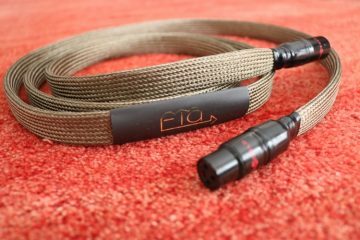 Comparing the Cardas Clear directly to the Mad Scientist FCG+ simultaneously connected to the Bricasti’s independently buffered outputs, the two cables turn out to sound tonally more similar than different. The most obvious difference between the two is that the Clear tends to sound more open and articulate and the FCG+ warmer and creamier. 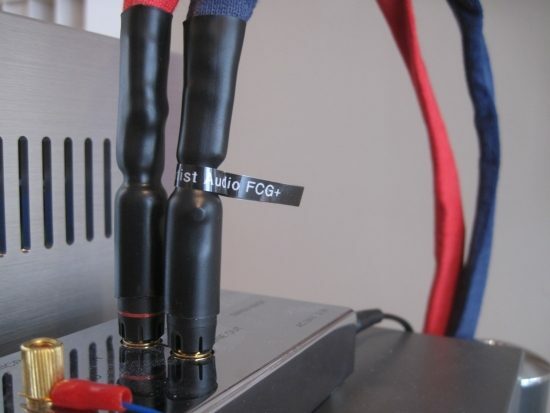 Just as with the preamp, disconnecting the unused cable adds a little bit more bite to the sound, which compliments the FCG+ perfectly. Although the Cardas reveals more low level detail, the longer you listen to the FCG+, the more it grows on you. There’s something about its rich and unfussy sound that makes it difficult to stop listening to it. 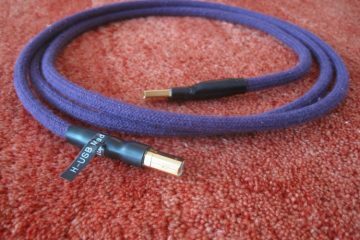 Richly saturated tonally, powerful and sonorous in the bass, full and creamy in the midrange and artfully refined and airy in the treble, with an overall lush yet energetic performance, no matter how I used it, this is a supremely satisfying and musical cable. Superbly synergistic with the Lukaschek, my samples sure are not leaving the analog setup anymore. Quite simply the FCG+, and I assume the more basic models just as much, are a must-hear, and with a 30 day money back guarantee that is a risk-free adventure.